Layer (aka overlay, blend, merge) two clips of possibly different sizes, but with the same color format. 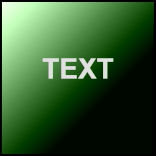 For pixel-wise transparency information, the alpha channel of an RGBA overlay_clip is used as a mask. The underlying clip, which determines the size and all other video and audio properties of the result. Color format must be YUY2 or RGB32. The clip which is merged onto clip. If RGB32, the alpha channel is used as a mask. Color format must match base_clip. This is the default mode. Equivalent to Overlay(mode="blend"). overlay_clip will be copied on top of the original, in proportion to level, and subject to the alpha channel. The difference between base_clip and overlay_clip is multiplied with alpha and added to base_clip. subtract base_clip minus overlay_clip. The same as add, but overlay_clip is inverted before adding. If both clips are equal and level=128, a flat gray field is returned; compare to Subtract. lighten Copy overlay_clip over base_clip in areas where overlay_clip is lighter by threshold. Performs the same operation as add, but only when overlay_clip is BRIGHTER than base_clip. use_chroma must be true. Also known as lighter color. darken Copy overlay_clip over base_clip in areas where overlay_clip is darker by threshold. 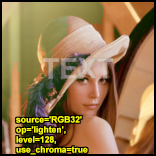 The same as "lighten", but it is performed only when overlay_clip is DARKER than base_clip. use_chroma must be true. Also known as darker color. mul base_clip multiplied by overlay_clip. This will generally make the output darker. alpha=0d → only base_clip visible. alpha=255d → approx. the same luminance as base_clip but with the colors of overlay_clip. fast Like add, but without masking. use_chroma must be true; level and threshold are not used. The result is simply the average of base_clip and overlay_clip. AVS+ autoscaled – works without changes at all bit depths. Changes the transition point of op = "darken", "lighten." Use chroma of the overlay_clip. Default=true. When false, only luma is used. Must be true for op = "darken", "lighten", "add." Audio, FrameRate and FrameCount are taken from the first clip. There is no mask (alpha channel) in YUY2, so the alpha channel is assumed to be fully opaque (255d) everywhere. (alpha * level + 1) / 256. This means for full strength of operation, alpha has to be 255d and level has to be 257. 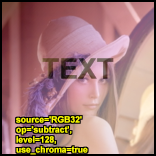 Applies a defined alpha-mask to a clip, by converting RGB32-only mask_clip to greyscale and copying that greyscale information to the alpha channel of RGB32-only clip. In the alpha channel, "black" means transparent and "white" means opaque. For those of you who familiar with Photoshop masks, the concept is the same. In fact you can create a black and white photo in Photoshop, load it in your script and use it as a mask. The base clip, which determines the size and all other video and audio properties of the result. Color format must be RGB32. AVS+ also supports RGB64 and PlanarRGBA. Alpha-mask source, as described above. Size and color format must match clip. Suppose "ss.jpg" is a snapshot from a video clip, which served as a guideline to create the mask using Paint. We use ImageSource to load the image in the script and Mask to apply it. Applies an opaque (white) alpha channel to a clip. The alpha channel of an RGB32 clip is not always well-defined, depending on the source (it may contain random data); this filter is a fast way to apply an all-white mask. Source clip. Alpha channel will be set to opaque. Color format must be RGB32. AVS+ also supports RGB64, PlanarRGBA and YUVA. AVS+ Optional mask value to set. No bit-depth scaling occurs, but value is clipped to be between 0 and maximum_pixel_value. Clears pixels in the alpha channel by comparing to a transparent color (default black). Each pixel with a color differing less than (tolB,tolR,tolG) (default 10d) is set to transparent (black); otherwise it is left unchanged – note, it is NOT set to opaque (white). That's why you might need ResetMask before applying this filter. This behaviour allows an aggregate mask to be constructed with multiple calls to ColorKeyMask. When tolR or tolG are not set, they get the value of tolB by default. Normally you start with a ResetMask, then chain a few calls to ColorKeyMask to cause transparent holes where each color of interest occurs. See Overlay for examples. Source clip. Color format must be RGB32. Color tolerance. See description above. v2.58 ColorKeyMask: Added separate tolerance levels.